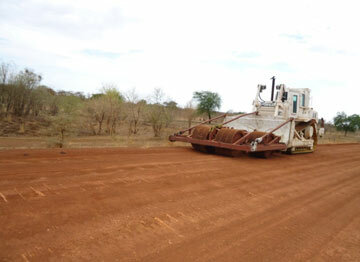 Earlier this year, TDI fabricated a Route Verification Mine Roller System (RVMRS) based on a design developed in the early 1980s by the Zimbabwe Corp of Engineers to conduct route verification in Abyei. The RVMRS is capable of intrusively verifying routes to establish that there is no evidence of mines. It is not a mine clearance first asset such as MineWolf or equivalent mine clearance systems, but a “pathfinder vehicle” to verify whether some of, or the entire designated route, is mined. The system comprises a set of route verification/area reduction rollers mounted on the front of an armoured Caterpillar D7 Medium Crawler Tractor (MCT). The five rollers, each 60cm wide with a diameter of 90cm, are filled with water and independently suspended within a frame 3m wide. Each roller has this water ballast to maximise the pressure applied and can easily be replaced in the event that they are damaged in an explosion. Each roller weighs at least 1,000 kg and in average ground the system can verify a lane 300cm wide at a speed of 5km per hour. The front of the frame is designed to push through and flatten vegetation and small bushes/trees if required. In recent operations in Abyei, TDI deployed these Route Verification Rollers in conjunction with Mine Detection Dogs and Manual clearance teams. Verification of an 8m servitude including an overlap of 1m was achieved by three passes of the rollers: once forward on the centre line, back on the left side and then forward again on the right side before proceeding to the next sector/section. “While deploying the system to the area of operations was a challenge, once there, it verified 5-10km on average per day,” said Colonel Andrew Roseveare, TDI’s Senior Technical Advisor.